Day 95: The Academic Staff Union of Universities, ASUU, has officially suspended a strike it commenced three months ago. The suspension of the strike was announced on Thursday evening after a meeting between the ASUU leadership and a government delegation led by labour minister, Chris Ngige. The ASUU delegation was led by its president, Abiodun Ogunyemi, who announced the suspension of the strike. At the meeting, a memorandum of action was signed by the two parties. Academic activities are expected to resume tomorrow. Day 94: The latest report is that the national leadership of the Academic Staff Union of Universities, ASUU, yesterday directed the members of the union to conducted a referendum on the offers made by the Federal Government in order to determine if the 3 months old strike embarked upon by the union should continue or be suspended. Day 83: The Academic Staff Union of Universities on Thursday said the Federal Government had failed to make a fresh offer on funding for the revitalisation of the nation’s public universities. The union also stated that the Federal Government had yet to address the issue of renegotiation of the 2009 FGN/ASUU Agreement in its new offer made to the union last Monday. Day 78: The Federal Government said it has released N163 billion to the universities from the Tertiary Education Trust Fund but striking academics are stalling in calling off their strike. Senator Chris Ngige, Minister of Labour and Employment, said this while addressing newsmen after a closed-door reconciliatory meeting with leaders of Academic Staff Union of Universities on Monday in Abuja. ASUU on the other hand is expected to again consult with members before taking the next step, and then reach the FG for another meeting, at a later date. Day 75: The Academic Staff Union of Universities, ASUU, has asked the Federal Government to release ₦50 billion to demonstrate its commitment to the revitalisation of public universities, in line with previous agreements with their union. The ₦50 billion, according to ASUU, will form the first part of the ₦220 billion government agreed for the project this year and add to the ₦20 billion earlier released for the year. ASUU has said that they called the current strike to press for improved funding of universities and implementation of previous agreements with the government. Day 69: Recent reports have it that the hope of many university students across the country to resume academic activities soon may have been dashed for now. The striking Academic Staff Union of Universities (ASUU) has rejected the offers made to it early this week by the Nigerian government. The union is said to be preparing its response to government and are consulting to decide when they would meet the government to reopen negotiation. Day 68: Media reports have it that the Academic Staff Union of Universities on Thursday said the ongoing strike would not be called off until the Federal Government fully implemented all the offers it made to the union after their last meeting. The public university lecturers said they were tired of Federal Government’s antics of making unfulfilled promises, insisting that the strike would be called off after they got tangible evidence and concrete actions that the offers made to them by the Federal Government had been implemented. Day 64: According to news reports, except any last minutes change occur, academic activities may resume in public universities next week, as Federal Government has approved over N35.4 billion for the striking Academic Staff Union of Universities (ASUU). According to the he Minister of Labour and Employment, ASUU is expected to return back to Government between Wednesday, 9th or Thursday, 10th January, 2019 to sign relevant agreements reached by the parties. We hope this is the last meeting they will need to have. Day 63: The Minister of Labour and Employment, Chris Ngige will lead the federal government team, including the Ministers of Finance and that of the National Budget and Planning to a crucial meeting today with the Nigerian Labour Congress (NLC), Trade Union Congress (TUC) and other labour unions, as part of his efforts to avert the planned industrial action by the labour over the delay in the implementation of the recommended new minimum wage. The federal government negotiating team will also hold another round of discussions with the leadership of ASUU today. Day 60: According to media reports, President Buhari has appealed to NANS and labour unions to reduce their agitations to enable his administration to concentrate on repairing damaged infrastructure. He said this during a meeting with the executive committee of the National Association of Nigerian Students at the State House, Abuja on Thursday. He specifically called on the Academic Staff Union of Universities to appreciate the efforts of his administration at fixing collapsed infrastructure. Day 59: The National Association of Nigerian Students, NANS, has issued a notice to all its structures and organs to commence mobilisation for mass action against the Federal Government, the Academic Staff Union of Universities, and the Academic Staff Union of Polytechnics. This was contained in a statement signed by the association’s President, Danielson Akpan who blamed the parties involved of not making appreciable steps in resolving the crises. Akpan also said the mass action would commence on January 7th. Day 56: The National Association of Nigerian Students, NANS, said on Sunday that its patience following the strike in the nation’s public universities, had been overstretched. The body said its deadline fixed for December 31 for the Federal Government and the Academic Staff Union of Universities, ASUU, to resolve their differences and call off the ongoing strike was in force, vowing that it would mobilize members to the streets in protest after expiration of deadline. Day 49: The Academic Staff Union of Universities (ASUU) says it may not honour further calls by the federal government for a meeting on the way forward over the current strike by its members. The union’s National President, Biodun Ogunyemi, said this on the sideline of a news conference on the update of the union’s struggle to salvage the country’s public universities from deterioration on Sunday in Lagos. According to him, government is yet to show commitment and sincerity in addressing the problems tabled before them. Day 44: President Muhammadu Buhari has called on the Academic Staff Union of Nigeria Universities to call off the industrial action embarked upon by its members in the overall interest of the nation. The President made the call in Ndufu-Alike, Abakaliki, during the third convocation of the Alex Ekwueme Federal University, Ebonyi State. Represented by the Deputy Executive Secretary, National Universities Commission, Mr. Victor Onuoha, Buhari said the Federal Government had provided the requisite environment for teaching and learning in Nigerian universities and as such, are urging ASUU to suspend its ongoing industrial action in the overall national interest. Day 42: The Federal Government has said that talks with the Academic Staff Union of Universities (ASUU) have so far been fruitful, expressing optimism that the ongoing strike by the university teachers, will soon be called off. According to the Minister of Labour and Employment, Chris Ngige, this is predicated on the FG’s consideration of some of ASUU’s demands, including the submission of the union’s list of outstanding payments, and the identification of some areas in the universities in need of revitalisation as contained in the signed 2009 agreement. Day 37: Another meeting between the federal government and the Academic Staff Union of Universities (ASUU) ended on Monday night without an immediate resolution of the dispute. The meeting which held at the Federal Ministry of Labour was to find a lasting solution to the ongoing strike by the university lecturers. At least four other meetings have been held between both parties before Monday’s since the strike commenced on November 4. While addressing journalists, the minister of labour and employment, Chris Ngige, said the meeting has been adjourned to December 17. Day 32: The Minister of Labour and Empowerment, Chris Ngige, on Wednesday, said he would hold a meeting with the leadership of the Academic Staff Union of Universities to find a lasting solution to issues leading to the ongoing strike embarked upon by the union. In a statement signed by the Director of Press at the ministry, Samuel Olowookere, which also responded to a statement credited to Femi Falana (SAN), where he described the no-work-no-pay policy of the government as illegal, Ngige said every policy of the government was backed by the provision of the International Labour Organisation, stressing that while ILO backed strike, it also recognised provision to withhold wages. In the statement, it was said that a meeting has been convened for Monday, December 10, 2018, at the Conference Room of the Minister of Labour and Employment. Day 31: According to media reports, the meeting that was held on Tuesday Night between ASUU and the Federal Government, in a bid to end the on-going strike still ended unresolved. What this translates to is that the ASUU strike will most likely continue indefinitely. The President of ASUU, Biodun Ogunyemi, briefed Journalists after the Tuesday meeting, that both ASUU and FG were unable to reach any final agreement that would result in a decision to end the strike. Day 29: The Federal Government has withdrawn the recent threat of ‘no work no pay’ against ASUU. This was disclosed by the National President of the Academic Staff Union of Universities, ASUU, Prof. Biodun Ogunyemi, in an exclusive chat with newsmen. He mentioned that the negotiation meeting between ASUU and the Federal Government would continue tomorrow. Day 28: Following the strike declaration of public universities, the federal government, Saturday mandated all the vice-chancellors to stop the payment of any lecturer who embarks on strike and neglects his duty. This no-work-no-pay rule was contained in a memo issued to universities and inter-varsity centres by the National Universities Commission (NUC). Signed by S.B. Ramon-Yusuf, director, research, information and technology, the memo instructed that any attempt to pay the workers’ salaries from any other sources would be termed as a violation of extant rules and government’s directives. Day 27: The Academic Staff Union of Universities (ASUU) recently warned that the ongoing strike by its members may last for a prolonged time as no concrete resolution has been reached in the negotiation with the Federal Government. The president of the union, Biodun Ogunyemi called on parents and students to show understanding and solidarity with the union as this is towards saving Nigeria’s university system from collapse. Day 24: The Meeting by the Federal Government and leaders of the Academic Staff Union of Universities yesterday Monday 26th, November 2018 also ended in deadlock just as the first meeting. Botht parties were unable to reach a middle ground. This implies that the strike by the lecturers continues as the meeting could not conclude on whether ASUU should return to work or not. Day 22: The Academic Staff Union of Universities, ASUU, yesterday, vowed to continue the ongoing strike until the Federal Government meets or agree to meet all its demands. Reacting to a comment by the Minister of Labour and productivity, Dr Chris Ngige, that the strike action by the union is political, the Chairman, of ASUU University of Ibadan, Chapter Dr Deji Omole, clarified that the strike was declared over alleged failure of the President Muhammadu Buhari-led administration to fulfil the content of the Memorandum of Action it signed with the Union in 2017. Day 20: The National Association of Nigerian Students (NANS) has threatened to jeopardise the chances of Muhammadu Buhari winning the 2019 presidential election if the President refuses to meet the demands of the Academic Staff Union of Universities (ASUU) and Colleges of Education Academic Staff Union (COEASU). This was disclosed by the NANS’ National Public Relations Officer, Azeez Adeyemi, on Monday after a peaceful protest by the association in Abeokuta, Ogun State. Day 18: Indications show that the ASUU strike action embarked upon by the Aacademic Staff Union of Universities (ASUU) will still continue for a while as the meeting, held yesterday, with the Federal Government ended in a deadlock. 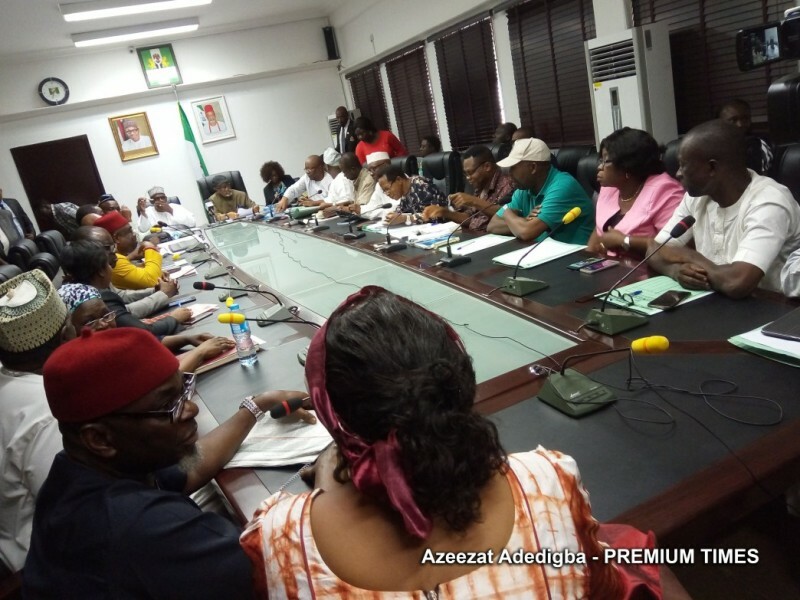 No compromise or decision was reached after the meeting to end the ASUU Strike, which began 3 p.m and ended 8:15 p.m on Tuesday. The meeting will continue next week. The Minister of Labour and Employment, Chris Ngige, however stated that government’s discussion with ASUU will continue next week. According to Ngige the delay in calling ASUU for a discussion was caused by the mimimum wage negotiation. Day 16: The Academic Staff Union of Universities (ASUU) will today hold a crucial meeting with the Federal Government to over the ongoing strike action by the union. The meeting is scheduled for 1 p.m., and was called at the instance of the Minister of education, Adamu Adamu, and the government’s negotiating team. The president of ASUU Biodun Ogunyemi confirmed that the FG has invited the union to a meeting adding that the meeting will determine the seriousness of the Federal Government towards ending the strike. Day 13: The Academic Staff Union of Universities (ASUU), has stated that the union is ready to negotiate with government toward ending its one-week old industrial action. This was disclosed by the President of the union Prof. Biodun Ogunyemi, who was a guest on TVC News Breakfast show on Tuesday. He frowned at the attitude of the FG towards the demands of the lecturers. Day 11: The Academic Staff Union of Universities (ASUU) has disclosed that the federal government is yet to invite the union to any form of negotiation towards resolving the strike. This was revealed by the president of the union, Biodun Ogunyem in a telephone chat with news men. Mr Ogunyemi said the union has placed a memorandum before the government on how universities can be funded, but nothing has been done on it. Day 9: According to reports, the Nigerian Senate is currently making efforts to ensure the ASUU strike is called off for the overall interest of the nation’s education sector and the Nigerian students. The Senate had on Tuesday mandated the Chairman, Senate Committee on Tertiary Institutions and TETFUND, Senator Jibrin Barau, APC, Kano North, to immediately initiate a meeting with the Minister of Education, Adamu Adamu and the leadership of ASUU to have a common ground to resolving the matter. Day 7: Students of the Obafemi Awolowo University, Ile Ife, have been thrown into dilemma after the school’s branch of the Academic Staff Union of Universities (ASUU) held its congress on Tuesday. Briefing journalists on campus after the congress, Adeola Egbedokun, the branch chairman of the union, reiterated the stance of the national body, that the strike is total. Day 4: The Minister of Education, Adamu Adamu, has appealed to the Academic Staff Union of Universities (ASUU) to call off the ongoing nationwide strike. There was partial compliance by universities across the country on Monday with the nationwide strike called by the Academic Staff Union of Universities on Sunday. The national President of ASUU, Prof. Biodun Ogunyemi, had on Sunday night announced the union’s decision to go on an indefinite strike. Day 1: According to renowned newspapers such as the Punch, the Academic Staff Union Of Universities (ASUU) has commenced an indefinite strike. Specifically, the union accused the government of not implementing the Memorandum of Action signed with it, declaring that the strike would be total as all federal and state varsities would join the strike.